Novotel Charleroi Centre is located in the City Centre connected to Rive Gauche shopping mall. The train station Charleroi Sud is across the river La Sambre, which is just a 5-minute walk. Enjoy the modern, comfortable hotel rooms with free WIFI. 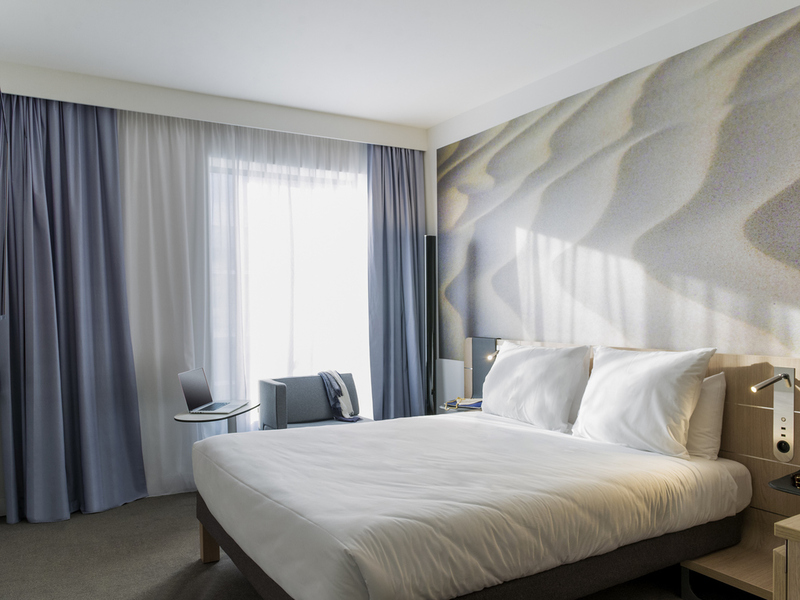 In the centre of Charleroi, on top of the modern and vibrant Rive Gauche shopping mall, you will find the brand new, stylish and family friendly Novotel. Unwind after a long working day or a day full of shopping in the convenient and modern rooms or relax yourself in one of the comfy seats at the bar and enjoy a drink and bite. Start your day energized by taking the advantage of an extensive and luxurious buffet breakfast. Feel welcome and at ease! Thanks to the location on top of the Rive Gauche shopping mall, Novotel Charleroi Centre offers the ideal opportunity to go shopping. Charleroi also has several museums, such as the Photography Museum and the former coalmine Le Bois du Cazier. The city hall Hotel de Ville, the Church of St. Christoper and the train station Charleroi Sud are within walking distance. Brussels South Charleroi Airport is 7 km from the hotel. Discover one of the many shops in the Rive Gauche shopping mall, explore the city centre or relax in one of the many restaurants and bars in the close surrounding of the hotel. Discover the new N room which offers everything you need for a comfortable and convenient stay. Be connected, be inspired and be energized. With the comfort of the Live N Dream bedding, the connection hubs, free WIFI and a luxurious rain shower, who wouldn't feel at ease? GourmetBar is a contemporary restaurant which emphasizes on simple, tasty and origional dishes. Available throughout the day, you will always find something to please your taste. Sit down and relax. GourmetBar is an informal place to gather, meet, drink and eat. In the cosy atmosphere of this bar we would like you to feel welcome and at ease, while enjoying a local beer, glass of wine, coffee or different bites. Overall good, but some improvements needed. New Hotel but the food, breakfast and coffee should be better. Good Stay and clean room. The food is not that good at the so called gourmet restaurant. Also the breakfast was not good for that price. The coffee was horrible and no milk refill at the coffee machine, asked twice that there is no milk for a cappuccino. modern hotel, with plenty amenities, central lcation, helpful staff. the only drawback was the expensive breakfast. Very nice stay. Had to wait a bit long at check-in.. Just after a group. It was good, how ever for the breakfast needs to have a good size plats. You are charding £25 per person And the plats are as someone Is being servered medication. The hotel was very comfortable and clean. My only issue was locating the parking garage. Staff was the best, the breakfast was extra special meaning selection. The bar staff attentive and supportive. Need to mention the bed was the best with the amazing large screen television. Good hotel, but, finding parking - terrible. Hotel was good and enjoyable. However, can the parking situation be looked at? This was a nightmare to find, especially with the one way system in town. The lift to use to get to the hotel from the car park could also be made a LOT clearer in terms of signs once you eventually manage to find the car park. In previous stays I received a new bottle of water every day, this time the water was not replaced. I went to the fitness room at 6am and found the water dispenser was empty - again no water. The Hotel is quite new and staff staff very friendly. Restaurant good as well.Only the access by car is a bit difficult - the parking garage of the attached Shopping Center is the only reasonable way to get there. Service is very good, staff were accommodating, rooms are tidy. Of course safe. Everything is good specially the rooms - super clean , nice to rest after a hectic day of meetings and discussion. Adding up are the staff- very friendly. Thank you I had a great stay, keep it up!! !